Tempe, also known as Hayden's Ferry during the territorial times of Arizona, is a city in Maricopa County, Arizona, United States, with the Census Bureau reporting a 2017 population of 185,038. The city is named after the Vale of Tempe in Greece. Tempe is located in the East Valley section of metropolitan Phoenix; it is bordered by Phoenix and Guadalupe on the west, Scottsdale on the north, Chandler on the south, and Mesa on the east. Tempe is also the location of the main campus of Arizona State University. 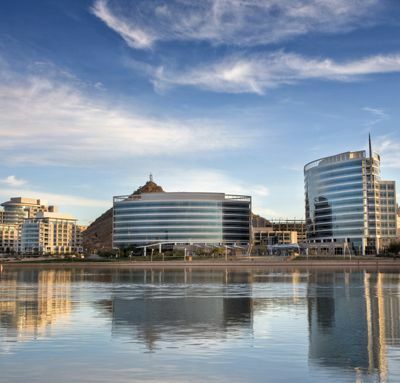 Tempe is the headquarters and executive office of one Fortune 500 company: Insight Enterprises. Limelight Networks, LifeLock, First Solar, the Salt River Project, Circle K, Fulton Homes and Mobile Mini are also headquartered in Tempe. Cold Stone Creamery was originally headquartered in Tempe and location #0001 is still in operation today at 3330 S McClintock Drive in Tempe. Tempe is also home to the first and largest campus of Arizona State University. It was the longtime host of the Fiesta Bowl, although the BCS game moved to University of Phoenix Stadium, located in Glendale, in 2007. It then began hosting the Insight Bowl which is now known as the Cactus Bowl. Currently, there is no bowl game in Tempe because of renovations to Sun Devil Stadium. Edward Jones Investments has a regional headquarters in Tempe.